This was one of those books that caught my eye while in a bookstore. 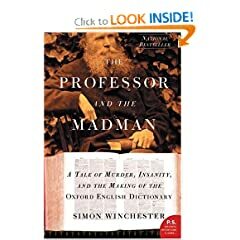 The cover and the title grabbed me (the full title being: “The Professor and the Madman: A Tale of Murder, Insanity, and the Making of the Oxford English Dictionary”). They made me pause and pick it up to learn more. I was very intrigued as to what this was about and initially assumed it was fiction. Instead I found a non-fiction book that detailed the true story of how the world famous Oxford English Dictionary (OED) came into being. I remembered fondly using this definitive compendium of words in college-had it really been created by a madman? Well as a writer and lover of words I guess madness is essential, but what was this about? As it turns out, the OED began life in 1857 as a project headed by Professor James Murray to collect and publish all the known words in English and standardize pronunciation and definition. Well that part is pretty basic and makes sense. But the project leader soon uncovered a mystery-1000’s of the words/definitions being submitted to the project were from one person: Dr. William Chester Minor. For twenty years they received his neatly written words/definitions but Minor steadfastly refused to visit Oxford. Finally, Professor Murray visited him and learned the truth. Doctor Minor was an American doctor, a Civil War veteran, a murderer and at the time indefinitely housed in an insane asylum (love the UK, he was “held at her majesty’s discretion”-wait that sounds like GITMO…I digress quickly). Now we wonder why people learning English as a second language have such difficulty-a crazy murderous American was behind the OED! Of course I’m being facetious, but what a story! The Professor and the Madman details the lives of both men and their relationship over the years. It’s a fast read, but stays with you long after you’ve read it. I won’t spoil any more of the details, but it’s a must buy. If you love writing, English, words, Scrabble, etc.-you owe it to the memory of these two men who played a critical role in shaping our lexicon to get this book.